We've held 5 events, funded 5 projects and we're stoked! Local artist Jimmi Buscombe presenting his idea to paint a flock of Yellow Tailed Black Cockatoos spanning the whole length of Ozone Walk at our very first event night in October 2017. I'm not sure Jimmi quite understood the mammoth task he had signed up for, but the community got behind Jimmi offering helping hands, resources and extra funding to make it possible. During March 2018 the flock came to life and it has added even more spark to the dynamic laneway. Special thanks to Warrnambool Art Gallery for offering extra funding for this project, to Hammonds for donating the paint and to Hire Australia for donating the use of a scissor lift. 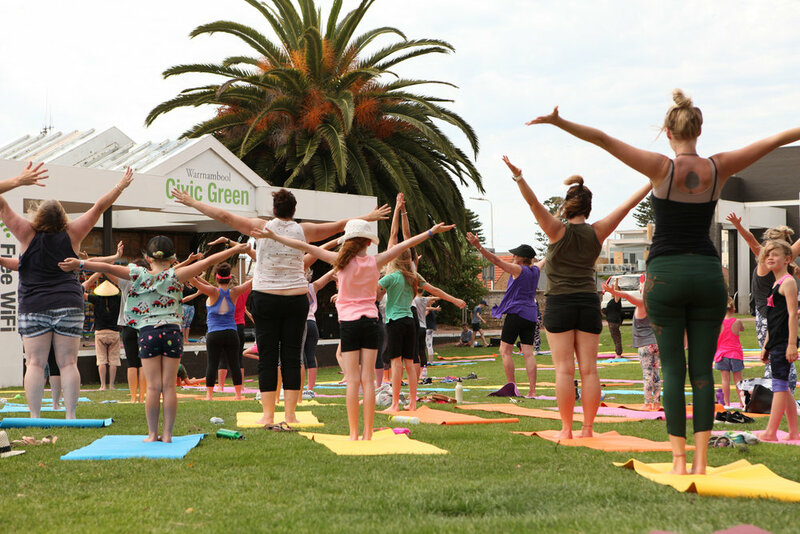 After winning the vote at Beers and Ideas Round 2, in December 2017, Peta, Cherie, Jane and Zoe get straight to work putting together a program of free family yoga days. Every Saturday morning in January, rain, hail or intense shine, the yogis were joined by a crowd of balanced bodies and smiles as they led these fun classes. The Warrnambool Yoga Project used Beers and Ideas as a spring board to launch their group, who have gone on to host other wonderful yoga events and put together a much needed directory of yoga classes for Warrnambool and Port Fairy. The very popular Sewing Station, presented by Brenda O'Connor at Beers and Ideas Round 3 was open and buzzing for 2 weeks in June 2018. Sewing machines, recycled fabric and workshops were available for the community to make reusable shopping bags and beeswax wraps. The cloth bags were made available to the community instead of single use plastic bags. Sewing Station aimed to inspire and educate our community to CLOSE THE LOOP in our use of textiles. We think this is just the start of big things for the Sewing Station! 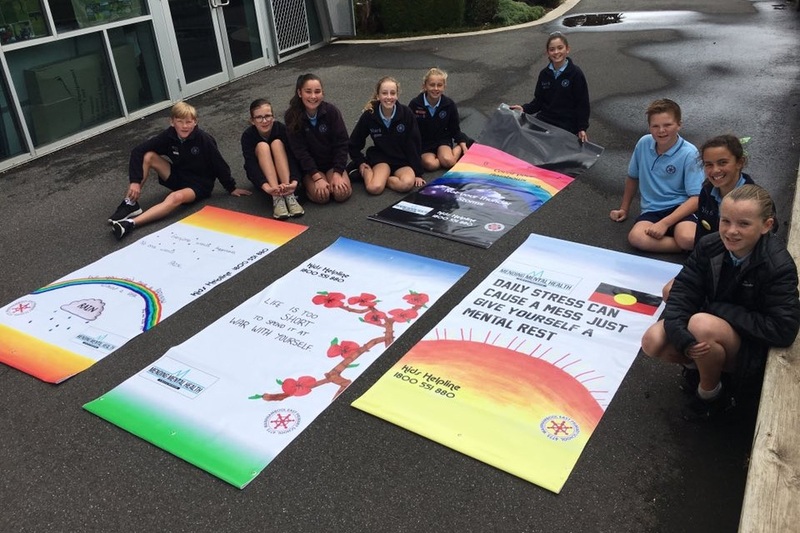 The WEPS Community Leaders idea to spread positive metal health messages throughout the CBD received the most votes at Beers and Ideas Round 4. The team used their funding to design vibrant messages for improving community mental health and displayed them all over the city. During the last few months of 2018, their messages were seen on round-about banners, posters in public spaces and on magnets and cards spread throughout local businesses. We’re totally in awe of the community consciousness and compassion shown by the WEPS leaders. We thank them for undertaking this important and meaningful project and wish them all the best for continuing to help reduce the stigma surrounding mental health by spreading positive messages. Go team! Dream big, start small seemed to be Luke Taylor’s ethos at Beers and Ideas Round 6, and one we think fits perfectly with placemaking. Luke painted a picture of a Bondi Icebergs-esc ocean pool and floating platforms when starting his presentation, but to test the waters (excuse the pun) and fit the budget, he settled on an equally lovely idea for simple swimming lanes in the Lady Bay. After much work from council and Luke to get the project approved and installed, the lanes were officially opened on March 1st 2019 and have been well used since. Head down to Worm Bay if you’d like to try for yourself!